I'm from Spain, and I recently purchased a N64 in France. I was looking for the NUS-001(FRA) model, as I read that it may be moddable. I opened it, and, I was lucky. VDC-NUS present (in fact, "VDC-NUS A"), but more surprises have to come. I connected some wires to the av output, to test which points were best to solder. I tested directly with the VDC-NUS pins, and with the points below, and both were a bit dark. Then, I looked at the front PCB, near the VDC-NUS, there is another chip, that I think it is not on NTSC PCB's, named U5 and with the text "S-RGB A". The name says it all, so I tested the three points that outputs, and, picture was a bit bright, but using 75 ohm resistors, the picture looked better. Sorry to bump this thread, but I find this VERY interesting. As the original poster says the S-RGB chip is not present on NTSC N64's - so what does it actually do? Also, I am really intrigued by the fact that this French N64 has all the traces necessary for RGB - even the early NTSC N64s dont seem to have these. All it needed were some surface mounted components to finish it off and im sure we could have an RGB'd N64 as Nintendo 'originally would have done it', so to speak. Surely someone here can figure out what all the missing components should be? This could probably help make a better RGB mod for NTSC N64s aswell, if we could only figure out what parts were originally intended to be used. Does anyone know if development 'Partner' N64's have RGB? If so they may help us complete the circuit? Im amazed this post didnt get more attention at the time - only 37 people even looked at the rear photo! Though I have no idea what component values nintendo had intended to use. Shortly after opened the topic, I completed the blank places on the backside of the PCB, with what you can see in the attached picture. It works but it is not perfect, I'm not a video expert. I soldered a 75 Ohm resistance on the R41, R43 and R45 places, and non to the rest (R42, R44, R46, C11, C12, C13) and short circuited the places where Q1, Q2 and Q3 where supposed to be. But I think it would be more correct to place these 75 Ohm resistors on R42, R44 and R46, and put 0 Ohm resistors on R41, R43 and R45. C11, C12 and C13, I think they are there, as it was in some SNES PAL models, where the GameCube RGB cable (with already included capacitors on the lines), showed a progressively dark image, because of the extra capacitors. So, if I was to going to use the GC RGB cable, there was no need to put anything there. S-RGB is an interesting thing, I think I have seen it at least in the American SNES-2 (the redesigned model). It seems that I have lost the original scans of the full PCB, but I'll do it again as soon as possible. The 3-legged Q units are transistors. If you're going to put some transistors in there you'll pretty much have to know what kind they are... It's probably not too hard to work it out, but I'm not the right person to ask. It might help if you were to work out the circuit for at least one of the R, G or B lines (they're probably the same) so better guesses can be made. I am no electronics genius (I only started modding 6 months ago) but I hope I can contribute to solving this. Firstly, I am pretty amazed by this French N64 - Not even the development systems released before launch have any traces of RGB left like this! I guess this means it is one of the earliest designs or the N64 motherboard? It all looks like its a small amplification circuit - perhaps thats what it is? The Q points are Transistors (just because of the fact they have three points) although we dont yet know the value to use. For each of the Red, Green and Blue lines. No idea what value though. Is there a standard voltage for the Red, Green and Blue lines on a scart lead so that we can complete the circuit and test the output voltage until we get it just right? Also, I would love to know what the S-RGB chip (U4) actually does - It was replaced with the ENC-NUS chip on NTSC systems, which has half as many pins, and looks to be missing the ones for RGB. That is why on an NTSC system you need to tap the RGB before it goes into the ENC-NUS chip. I wonder if the S-RGB chip actually does anything with the RGB lines? or does it just use them to 'make' the S-Video and Composite output, and then pass them on unchanged? If so the S-RGB chip would not be needed to perform this mod on a console which doesnt have it. But I wonder if the chip has to be actually 'programmed' to become the S-RGB chip and perform the same function? The only problem is the traces on this PAL SNES are covered in brown paint(?) and you cant follow them easily like on the N64. Great pictures from the SNES, from that I will try to take the components from a spare SNES, and put them in the N64. 750 and 390 for a surface resistor mean 75*10^0 and 39*10^0, that is, 75 and 39 ohm each. The D4 diode and R47 are for the auto-switch funcion pins in the scart connector, and they are interconnected, on the other side of the PCB, R47 connects to a 12v point. The correct voltage values for RGB, are, if I remember correctly, 0.75Vpp, to fine tune this video circuit, a oscilloscope will be necessary, but, as it seems that the snes uses the same output chip, we can just recreate it, isn't it? So the R47 and D4 points are not essential - only for the scart switching. You can usually turn TV's to the RGB channel manually, so I guess we dont really need them. I think it would be right to use the same components from a PAL SNES - Now that I think about it I remember that many people remove the capacitors on Scart leads for the SNES, and then add 33/47ohm resistors on the RGB lines.
" PAL SNES systems do not need these caps, but may require some 47 ohm resistors in their place in order to get the video contrast down to the correct level"
I have looked up the BQ14 Transistors some more, but I cant seem to find information on its characteristics/values Any ideas? Also, I would love to confirm that the SNES used 220uf cacpitors on the RGB lines, but I dont have a Capacitor Meter to test mine. Does anybody have one and a PAL SNES they can test? 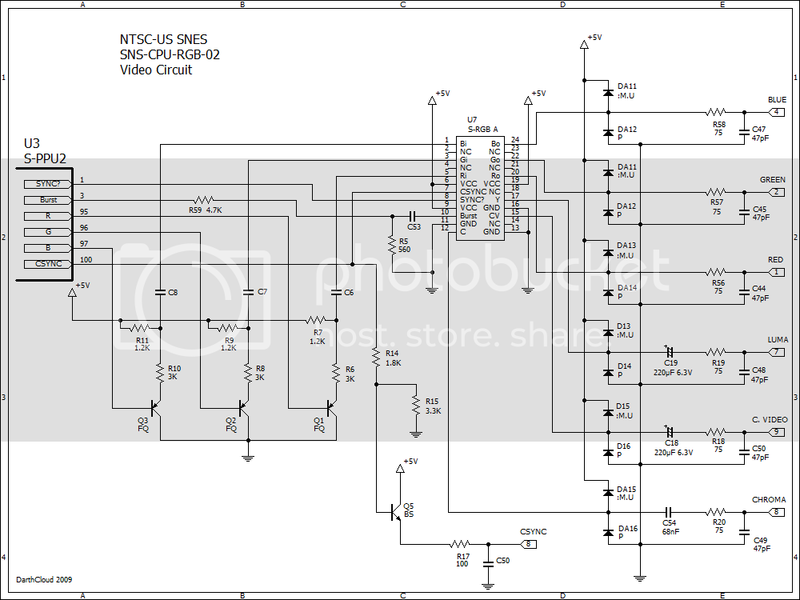 If we can find out if the S-RGB chip is necessary or not I am hoping we can add this circuit to any N64 with the VDC-NUS chip. If we take the RGB at the last available point before it goes into the ENC-NUS chip (After C124, C125 and C126) we should be able to get a picture exactly the same as this one produces. All we would need to do is build a small circuit with a transistor, resistor and capacitor on each line and we would be in business! I just noticed that on your picture of the motherboard there are two points labelled JP2 and JP3 which needs jumpers to complete the circuit. My guess is these are meant to be for S-Video output (Chromo and Luma) from the RGB-S chip. If you put a jumper there I think you will get S-Video output on this N64, but you may loose/mess up the RGB output as I know S-Video and RGB use the same Scart pins. Also, if you manage to get a PAL SNES I would try and put the Transistors and Capacitors from the RGB lines on the N64. Your 75 ohm resistors are probably right and can be left there. Please let us know how it goes! If you can test the RGB signals just before and after they have passed through the RGB-S chip it would be very good to know if they change value at all. Then we would know if the RGB-S chip just passes the RGB signals through from the capactitors C124, C125 and C126 - Or if it amplifies/resists them in any way at all. I promise, but now I'm very busy to dissasembly the thousand screews it has! Hey, I have received the SNES spare for parts, and, it seems to have a little different video circuit. There is no S-RGB chip, but there is a very similar 24-pin chip, same packaging, and with the same capital "S" as you have in your SNES, but labeled "S-ENC A". This SNES board is revision SNSP-CPU-02, Model No. : SNSP-001A(FRG) (SNSP-ESP at the bottom) with serial number UP16175914. What are the numbers from your Link83? One odd thing about this PAL SNES is that I have used the Official Gamecube Scart Cable for years and never had to remove the capacitors as some people have to. I had read that with PAL SNES consoles you had to remove the 220uf capacitors and add 47ohm resistors instead, but I have never had to do this and the RGB picture still looks perfect. Looking forward to seeing some more pics of your N64 board and possibly its serial number/product sticker if you dont mind? I found these pictures, I didn't remember that I toke them when I opened the N64. But I think that, every NUS-001(FRA) has the capability to do this mod, as when they changed this was because they began to sell the NUS-001(EUR). The strange thing is, the N64 I bought is a French launch machine and its motherboard has 1996 printed on it, whereas the NUS-001(FRA) you have has a 1997 motherboard! They had to use up the motherboards they had already produced for the French market, so to stop people complaining that 'their console doesnt support RGB but their friends does' they decided to remove the RGB components from all the French motherboards. This is just a guess, but it makes logical sense to me. As you also said, it is interesting to note that Nintendo has removed the S-Video output on these French N64's - so actually you can only get RF/Composite out of the NUS-001(FRA) unless you RGB mod it. Obviously Nintendo were going to do what they did with the Gamecube and Wii and remove S-Video output, but have RGB Scart output instead. Its also looks like they use the VDC-NUS chip aswell (just below the S-RGB A chip) I cant be sure because I cant see the code printed on it, but from the number of legs and its location it seems likely to be the VDC-NUS chip. If anyone out there has one of these Ultra 64 development and could take a picture of the other side, or tell us the components that are used on the RGB lines - then we could add the correct components that are missing on these French N64's! Too much to read past the intial point of observing those points that were mentioned about missing transistors. I can say for sure they are SOT-23 or SOT-323 package surface mounts, and judging from the pictures of others you've shown they are plastic encapsulated (PNP, not NPN) the values however.........your guess is as good as mine. You obviously have an idea of what kid of voltages are going across these lines, so take it from there. Sorry to go somewhat off-topic here, but I'm intrigued by Link83's mention of an RGB capable French NES model. What caused the poor quality you suggested? Would it be feasible to take the the output components from one of them and add it to an NTSC NES (with better results than the Playsomething PPUs with incorrect colour)? The French NES had the same video chip all the other Famicom and NES units had. It output only composite video, and extra circuitry would convert that to RGB for SCART output. I guess they only did this for compatability reasons back when alot of French TV's only supported SECAM signals and not PAL signals. That's a pity. Though I'm not surprised, someone would likely have thought of it long before I did if it was otherwise. I have been thinking about this RGB circuit alot, and 'think' I have figured out the components on the RGB lines. Its a Philips PNP general purpose transistor code 2PB709AQ. If you read the datasheet you will see that the transistors have the marking code 'BQ'. Unfortunately the 2PB709AQ is discontinued, but I would be interested in learning if the two other models mentioned (2PB709AR and 2PB709AS) could be used as an equivelant? The next points R42, R44 and R46 are likely to be 75ohm resistors to ground. I thought about it and realised that although there are four components on the RGB lines of this N64 and only only three on the PAL SNES (which both use the same 'S-RGB A' chip), there are actually resistors in the PAL SNES Scart cable aswell, which would bring the component count on the RGB lines up to four. Next up was R41, R43 and R45 which are likely to be 39ohm resistors just like the PAL SNES. Lastly are the capacitors C11, C12 and C13 which I think would be 47pf capacitors to ground, as these are the same value capacitors used on the S-Video and Composite lines of an NTSC N64. If im right that only leaves the R47 and D4 points left, which although are only for the +12v Scart Switching line would still be nice to have it working as intended. D4 is a definitely a Zener Diode (by the symbol printed on the board) but does anybody have any idea what sort of Zener Diode should be used in this instance? (What Voltage/Wattage?) Given that its on the +12v line after a resistor. Thanks for the info Can I just ask if both SFC's use the 'S-RGB A' chip? Also are there any numbers after LY? Only LY is marked on them, no numbers or anything else. There is no "S-RGB A" chip, only other video related chip than PPUs is BA6592F (on my EU SNES it is "S-ENC" chip). do any ntsc snes consoles have this s-rgb chip? i think it's only the pal snes that has the crappy coating on the back that makes tracing hard.. or have we already sussed the snes layout? ill admit i skipped a few posts in this thread. has anyone checked what's in a gamecube? theres a high chance it would be different, but it's worth ruling out just to be sure, right? also on a related topic, i'm going to start using rgb on my snes consoles.. i have all three region consoles (as said above), what cap/resistor combinations should i use for the rgb cable for each one? Yes some later NTSC SNES consoles have the S-RGB chip, and we havent 'properly' sussed out the PAL SNES layout yet - although I hope to look into it more soon. I mainly havent done it as I hate that brown/green coating the PAL SNES has aswell Makes it a nightmare to map it out. However we really need a picture/scan of the bottom to see the RGB components. Yes, I have checked the DAC in the Gamecube - it is a very different beast! Apparently it convert digital YCrCb data (not digital RGB data like the N64 had) into Composite and S-Video. It also converts digital sound data to analogue sound aswell, whereas the N64 and SNES had a separate DAC for sound. Although please note that it actually also depends on the revision of PAL SNES as to weather you really need the resistors or not. 1)To prevent people buying import RGB cables? Seems abit daft I know, as they didnt even release an RGB cable in every region, and Japanese and Euro Scarts are differently wired anyway (and the US dont even use Scart) so I dont know how that could have worked. The 'S-RGB' chip is totally different and does output the RGB, and amplifies it aswell. Really I think if Nintendo had wanted the RGB output to be the same for all regions they could have easily done so. ....I am beginning to think that the little circuit on this French N64 was only there in order to maintain 'backward compatabilty' with the French SNES Scart cable. Sorry to bright up an old topic, but I just found an original NTSC-US SNES with the latest motherboard revision (before redesign) which have the S-RGB chip and RGB circuitry (1995 SNS-CPU-RGB-02), I tryed it with my xrgb3 and the rgb picture is the same as another snes I have which have the old s-enc chip (1993 SNS-CPUGPM-02). Will trace the exact video circuit this week-end when I got some time. Hi DarthCloud, that would be really great if you could trace out the circuit - it would help confirm for certain the exact video components needed for both this French N64 and the SNES 2 as they both use the same 'S-RGB A' chip. If you can it would be great to get the full video circuit mapped out including C-Sync, S-Video and RGB, as both consoles are missing all these outputs. No one replied but perhaps my 'guessed schematic' can help you? I din't got much time to trace all line I've just done the line between S-RGB A and S-PPU2. If it only were that easy... The problem is that the ground plane is external on the back of the board and the traces are internal so even if you scrape off the solder mask (the green coating) you'll find a solid copper layer (the ground plane) that will make it impossible to see the traces. Actually, that entire components listing is parts that I suggested the missing components 'could be' further up this page - which I now know to be wrong After mapping out my PAL SNES some more I know what all the missing components should be, but the transistors are obsolete (They are not Philips transistors like I first thought but are actually made by Rohm) If anyones interested in the PAL video components I will try and clean up my scribbled down drawing which took hours to do thanks to that brown coating! Simply put, the originally planned video components for this French N64 were designed to work only with PAL SNES video cables (Which use 75ohm resistors to ground) Its not the layout the 'S-RGB A' chips datasheet would have recommended, its what Nintendo had to do to maintain backwards compatibility with PAL video cables. The NTSC method would be preferrable since it is the 'correct' method, its the layout the 'S-RGB A' chip was actually designed for, and is likely exactly what would have been recommended in the datasheet. It also means you could use 'standard' RGB cables with 220uF capacitors on R, G, B. Also, I have just noticed on the page you linked to they have even copied the mock-up picture I made previously in this thread, to show what the missing components would look like if soldered into place! Simply put, the originally planned video components for this French N64 were designed to work only with PAL SNES video cables (Which use 75ohm resistors to ground) Its not what the 'S-RGB A' chips datasheet would have recommended, its what Nintendo had to do to maintain backwards compatibility with PAL video cables. Ok, do you recommend to go with the known NTSC RGB mod including the amplifier instead on those early french models?? Since that also uses the 'S-RGB A' chip aswell it should work when used with an RGB cable using 220uF capacitors. However, what im hoping is if DarthCloud can make a layout/schematic for the video components on this NTSC SNES then we should know 'for certain' what components and values we should be using for this French N64 and the SNES 2/Super Famicom Jr.
- Wait and see if DarthCloud has any success mapping out the video components so that we know for certain whats needed to perform the mod. I didn't find the datasheet for M:U but it's obviously the same thing as "P" exept that instead of common anode like "P" it as commun cathode. Also my multimeter do not measure caps, so the cap value are what I guessed it should be according to the N64 video circuit in the GamesX wiki (see N64 RGB Driver). I should got a new multimeter soon so I will update the schem with accurate value later! I think way can safely say the main required component for RGB from the 'S-RGB A' chip is one 75ohm resistor in series on Red Green and Blue - and of course a standard NTSC RGB cable with 220uF capacitors aswell. For anyone interested in understanding the remaining components after the 'S-RGB A' chip the diodes are for ESD (ElectroStatic Discharge) protection circuit (Thanks Viletim for that info) so they are not entirely necessary unless you plan on hot-swapping cables, or rubbing you feet on the carpet and touching the connectors! Also, the final small value capacitor to ground should be for EMI (ElectroMagnetic Inteference) like a ferrite bead, so it varies if its worth adding or not. I have made another compare between the two output using my xrgb3 and the rgb-02 have a lot of noise on the picture. However my other snes give me a very sharp picture. I didn't pay mush attention the first time i tried that snes since a was a bit far from the monitor but in the front of it it's looking very bad :S.
Link, let me know how it look like if you mod a snes 2 using this! Kudos for this topic! Very interesting to read! Is it verified that all NUS-001(FRA) N64's do not support s-video? Which pic is that exactly?? There are consoles, like SNES, that support both s-video and rgb. How does that work then? (I'm getting a French rgb modded N64 from eBay, looking forward to it ). If pics for any database are needed, let me know. S-video doesn't work out of the box. I would love to know if this can be modded? !